renderings courtesy of Ennead Architects. 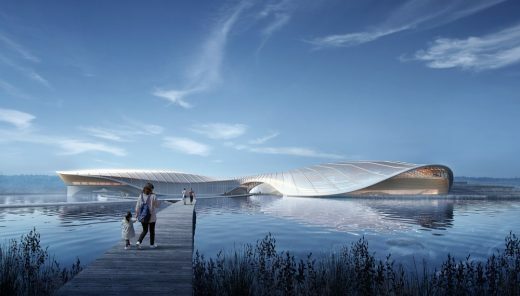 New York, NY (March 6, 2019)—Ennead Architects has been announced winner of an international design competition for the Shanghai Yangtze River Estuary Chinese Sturgeon Nature Preserve. 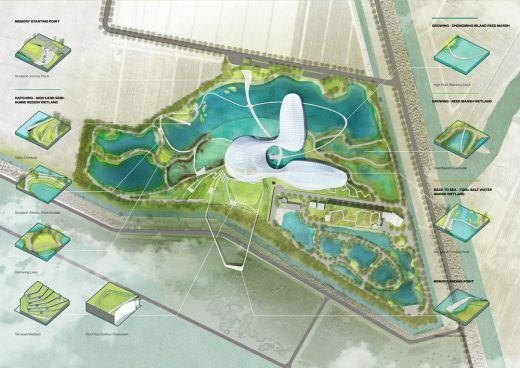 Led by Ennead Design Partner Thomas Wong, in partnership with Andropogon Landscape Architects, the project is an ambitious plan to rescue critically endangered species and restore biodiversity to a habitat beset by pollution and the impact of previous construction while raising public awareness and inviting action. 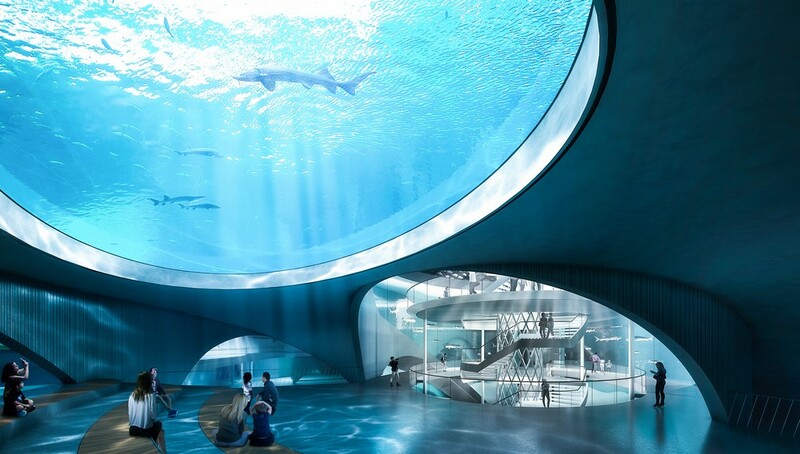 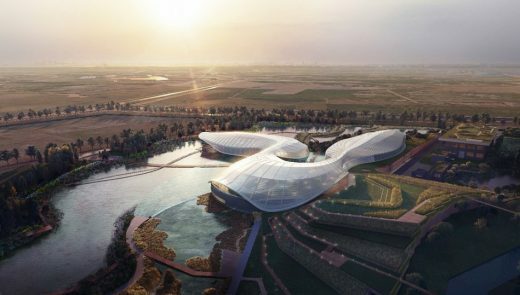 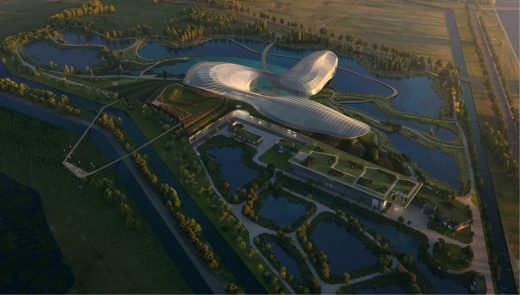 Located on an island at the mouth of the Yangtze River and set within a 17.5-hectare landscape, the 427,000 GSF nature reserve building comprises a dual-function aquarium and research facility, bringing together efforts to repopulate the dwindling numbers of Chinese Sturgeon and Finless Porpoise with an engagement of the public to build popular support for ecological conservation. 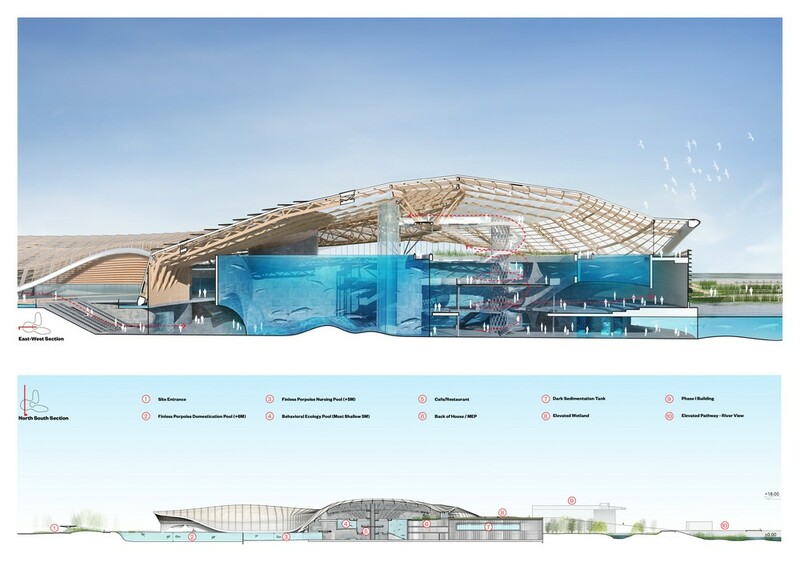 A complex program includes a series of interior and exterior pools for breeding and raising both species mimicking their natural migration into waters of varying size and salinity, as well as facilities dedicated to their research and reintegration to their natural habitat. 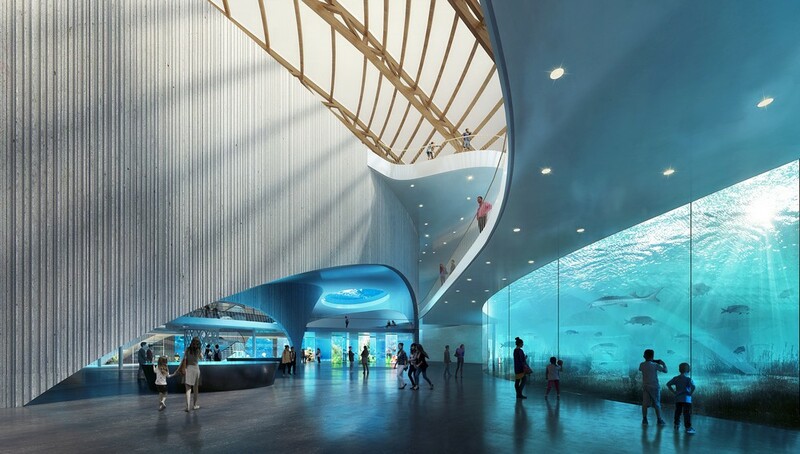 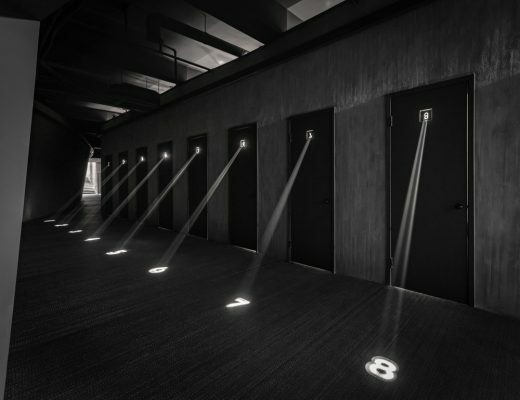 The project makes the important work of the institution visible to visitors through an immersive aquarium and exhibit experience, bringing them into direct contact with its activities. 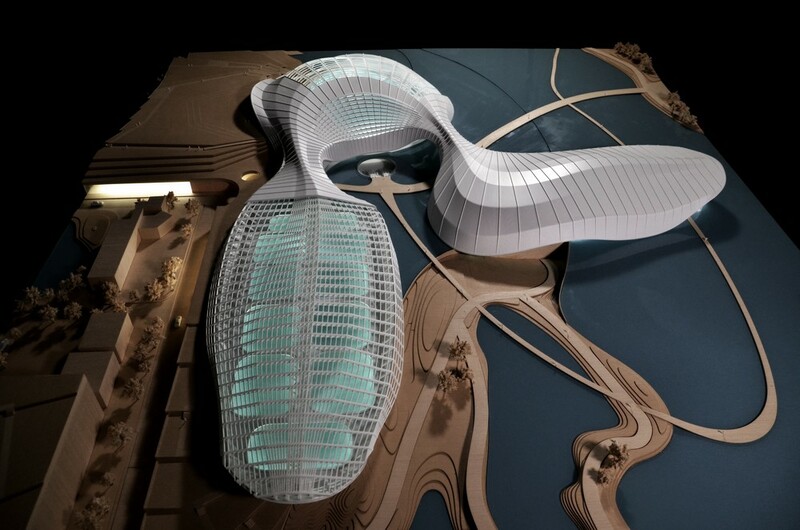 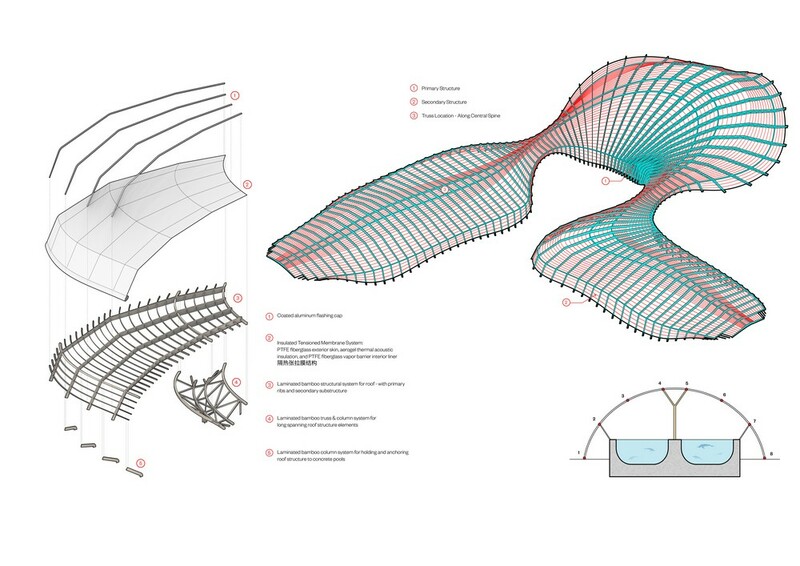 The proposed design features dramatic forms that rise in undulating, fluid gestures taking cues from the rippling surface of the river and the iconic landscape of the Upper Yangtze while simultaneously evoking biomorphic anatomy and a vessel-like ark. 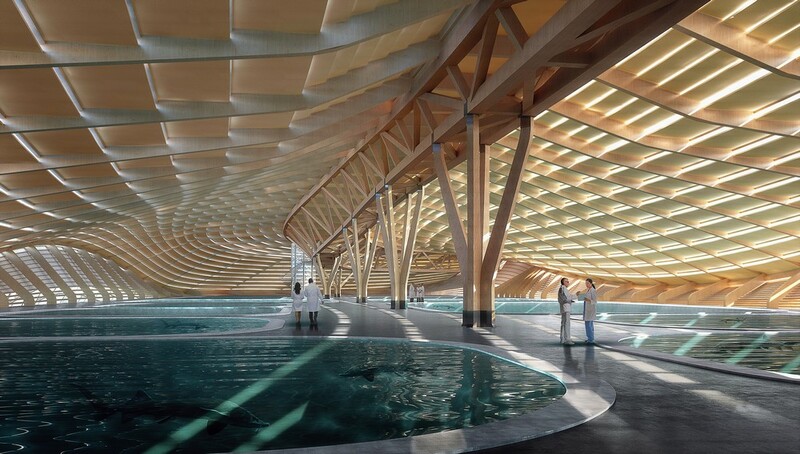 Gently curving wooden structural ribs radiate around a central spine that joins the three wings of the building into a singular unified expression. 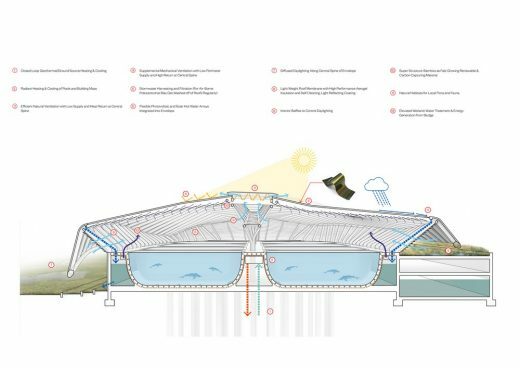 Clad in translucent PTFE, the lightweight enclosure system envelops the interior pools to create a luminous, daylight-maximizing interior. The design seamlessly integrates highly sustainable strategies, combining a cross-laminated timber structural system, geothermal heating and cooling loops, constructed wetlands of local flora and waterborne plants for rapid carbon sequestration and a process of biofiltration for aquarium water, resulting in a new paradigm of environmental equilibrium. 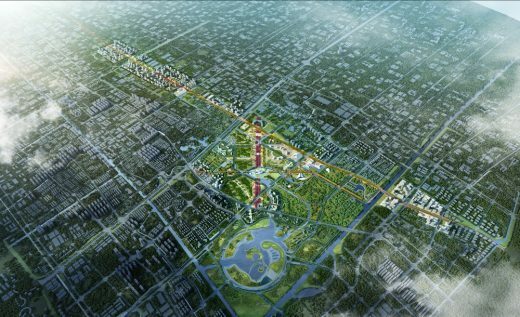 The landscape design reconstructs the shoreline system and the variety of ecoregions throughout the Yangtze River basin, establishing the critical balance between land and aquatic habitats. 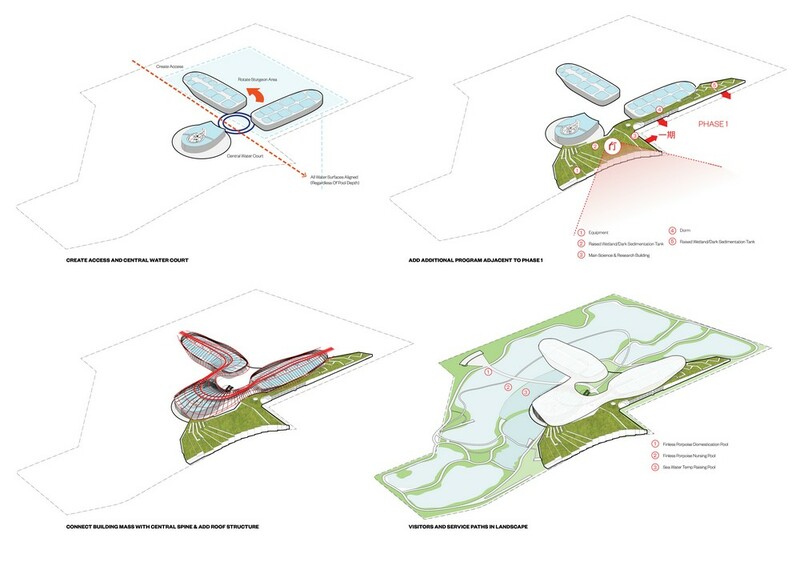 Suspended walkways and viewing areas circumnavigate the campus and allow visitors to immerse in a completely natural setting away from the dense urban core of Shanghai. Ennead Architects is an internationally-acclaimed, New York-based studio with an office in Shanghai. 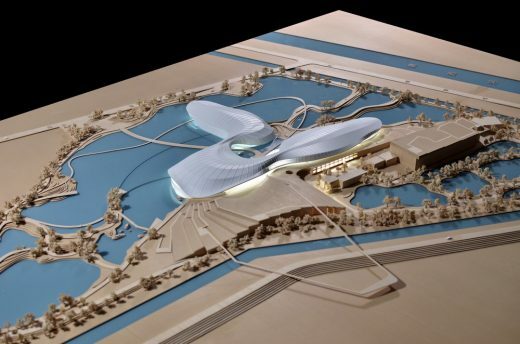 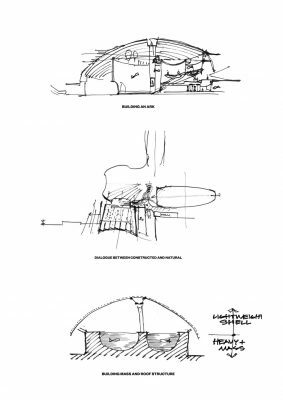 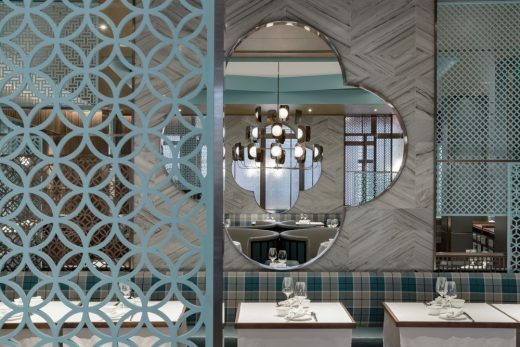 Renowned for its educational, cultural, scientific and governmental building designs, which authentically express the progressive missions of their institutions and enhance the vitality of the public realm, Ennead has been a leader in the design world for decades. 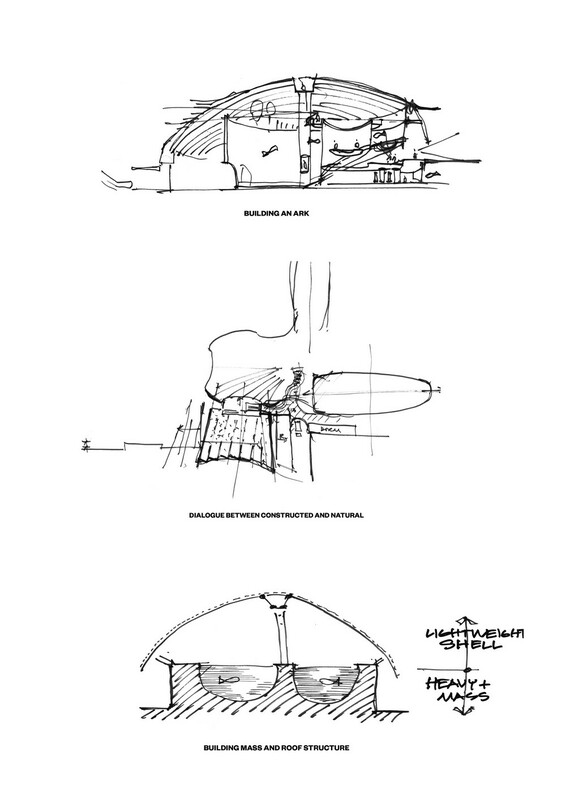 Recipient of the prestigious AIA NY Medal of Honor, the Smithsonian Institution- Cooper Hewitt National Design Award and the National AIA Firm Award, as well as numerous design awards for individual buildings, the studio has a portfolio that is diverse in typology, scale and location and includes new construction, renovation and expansion, historic preservation, interior design and master planning. Ennead’s collaborative process is rooted in extensive research involving the analysis of context, program, public image, emerging technologies and a commitment to sustainable solutions. 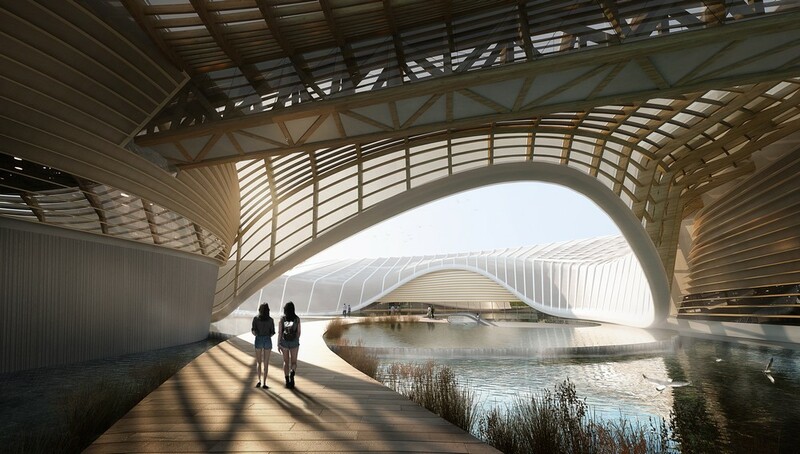 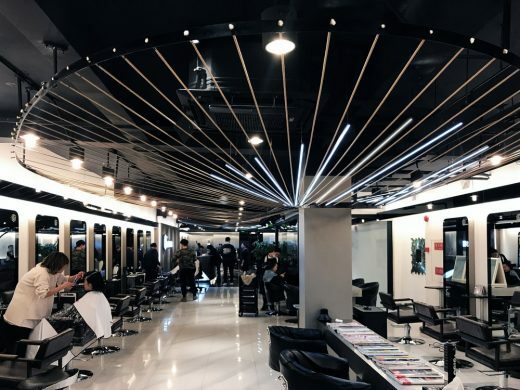 Founded more than forty years ago, Andropogon is committed to the principle of “designing with nature,” creating beautiful and evocative landscapes inspired by the careful observation of natural processes and informed by the best environmental science. 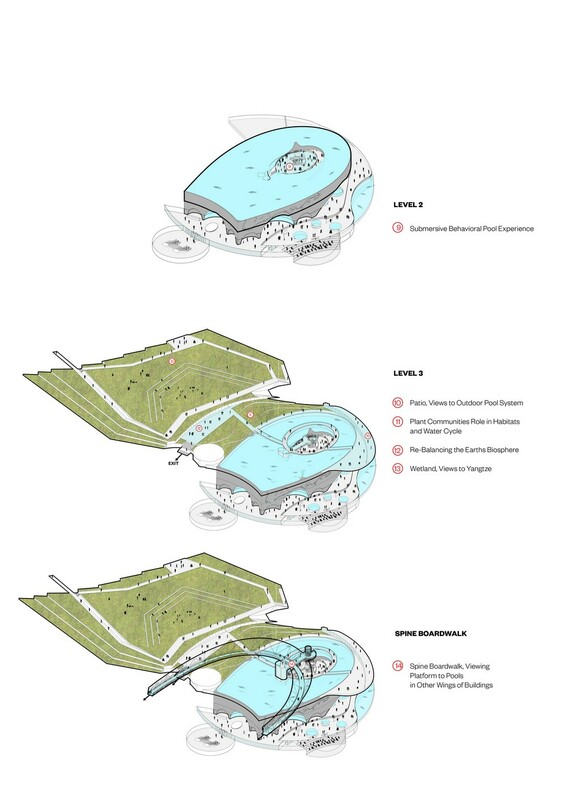 Andropogon’s body of national and international work includes early examples of innovative green strategies that have withstood the test of time, as well as a broad range of landscape, site planning, environmental projects, ecological restoration, and innovative stormwater management techniques. Andropogon was recently awarded as the American Society of Landscape Architect’s 2018 Firm of the Year, the highest honor bestowed on a landscape architecture firm in recognition of distinguished work that influences the profession.